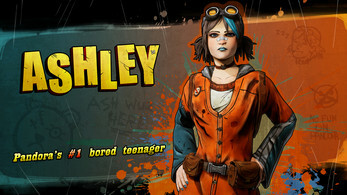 My character is Ashley, though she prefers Ash. 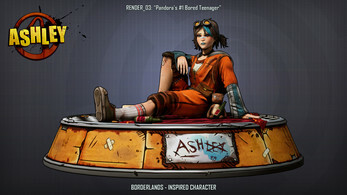 She’s a teenager who’s grown up on Pandora [the setting of the Borderlands games], a savage wasteland of a planet filled with bandits and monsters. Naturally, having grown up there and now in her late teenage years, she’s jaded and bored by the whole experience, spending her days scavenging the barren wastes and looking for something interesting. Her main outfit started out as a onesie and has been repaired and customised multiple times. The choice of outfit lets her express her child-like nature in an apocalyptic setting. I chose to make a unique character that would fit into the Borderlands games as an opportunity to try more stylised character sculpting and hand-painted texturing. Her child-like nature gives me an opportunity to play around with a mix of cute and apocalyptic themes. My sculpting could still use some work, mainly in making realistic cloth folds and getting in those smaller details like the backpack pulling down the fabric on the shoulders. Also, I think the concept itself could’ve used more work. I don’t think my character stands out as much as official Borderlands characters like Gaige or Tiny Tina. I think this is because of the choice of clothing and lack of accessories on the outfit. It might have been interesting to add some armour too. On another topic, I think the topology and UV mapping could be improved. There are some unnecessary edge loops, and the geometry of the face isn’t 100% optimal for animation, mainly around the nasolabial folds. As for the UV mapping, I think it would’ve been more optimal for a game character to have the head & hair on one texture set, then the rest of the body on another. I could’ve then used two 2048 texture sets instead of one 4096 texture set, reducing the performance cost and file size [this is likely dependent also on the character’s intended purpose though. 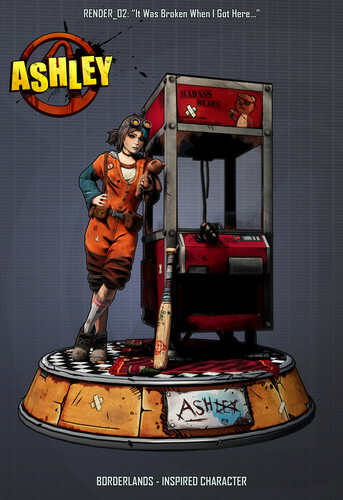 Tiny Tina, an NPC, uses one texture set, whereas Gaige, a playable character, uses two]. 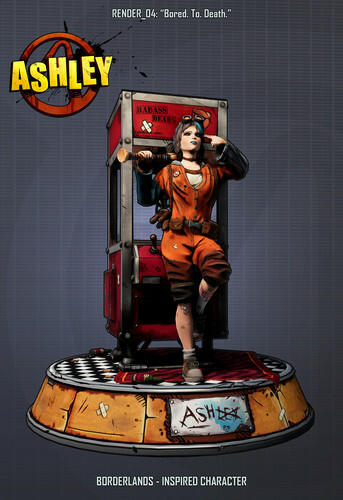 The skinning wasn’t the best, though it served its purpose for posing a character, it’d need more work to be a fully animated game-ready character. Learning about facial rigging would also be a good idea for my next project, since posing the vertices on the face by hand isn’t exactly optimal. The props could’ve used some more time too, though I’m not as concerned about them because they’re not the main focus. 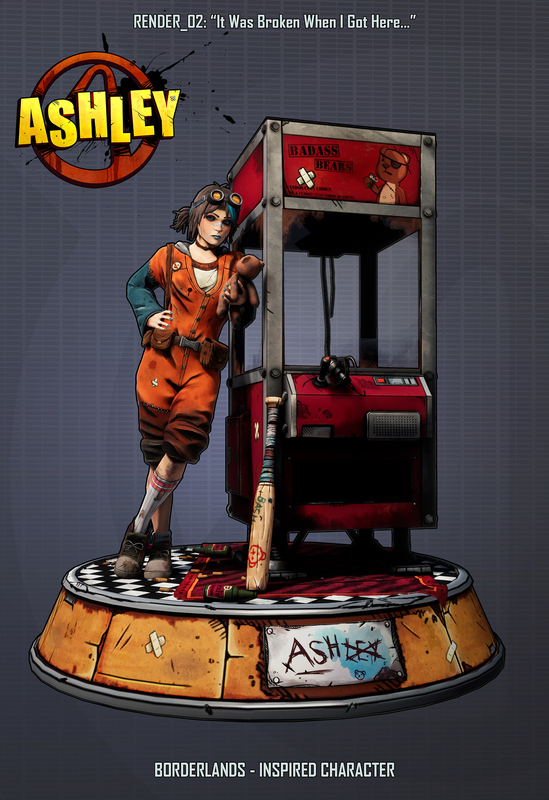 Though mainly I think the baseball bat needed more time spent texturing, and the logo on the claw machine could’ve looked better as proper vector graphics, sticking closer to that Borderlands vending machine style.